A Division of Simon & Schuester Inc.
It’s Christmastime at Pie in the Sky, Aunt Clara’s pie shop, and she has a new beau, Donald Wickerson, who loves her Marvelous Mince Pies. When Donald stumbles into Pie in the Sky and dies after being shot, Aunt Clara is devastated—and also a suspect, since everyone in Durham knows about Donald from Ryan’s newspaper article. Now Maggie and Ryan will have to prove that someone else in the long list of people he’d wronged finally got the courage to end his life. Pies, kittens and MURDER…OH MY!! Ellie Grant has served up another awesome story for readers to devour! Aunt Clara and Maggie Grady run Pie in the Sky, a shop featuring tasty delights like Evie’s Elegant Eggnog Pie, Marvelous Mince Pie and Pumpkin Pizzazz Pie. The are even going to start offering savory pies to bring in a lunch crowd. These two ladies are at work baking pies before the sun comes up and serving pie until late in the day. I don’t know how they do it and still find time to not only sleep but have boyfriends. Aunt Clara’s new beau, Donald, has quite a checkered past that she didn’t know about until right before he fell dead right in the middle of Pie in the Sky. Maggie has Ryan but he may have a little competition. Bring on the romantic tension… But the police looking much too closely at Clara as a suspect so romance aside Maggie needs to find out who really killed philandering Donald. She sees plenty of suspects, why can’t the police? I love these characters. Aunt Clara reminds me of my mother who also ran an eatery that was as important to her as Pie in the Sky is to Clara. Clara heart is huge and she always finds the “silver lining” to every situation. I felt so bad that she was falling for such a despicable man and then to have him die and her being suspected of killing him just broke my heart. But she persevered knowing she was innocent and handled it all with grace and dignity. Even some very scary situations. She is a wonderful woman. Maggie had a lot on her plate. 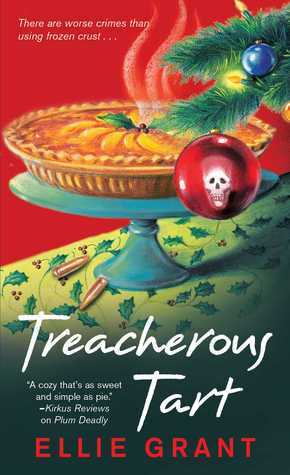 She not only had to keep the Pie in the Sky up and running and meet the commitment they had for a huge fundraiser, she also had to find the real person responsible for dastardly Donald’s death. We also were introduced to some fun furry felines. You will love their names. The author penned a fine mystery as well with quite a variety of suspects. Donald Wickerson had not only left behind scorned women but families and friends of those former wives who died due to “accidents” where he inherited all their money. The killer really could have been so many different people. The pages just flew by as we followed the clues until the awaited “aha moment”. A very entertaining read. You will be craving pie by the end so be sure to check out the included recipes, perfect for the upcoming holiday season. Thank you for the great review of this book. It’s on my shelf waiting to be read. Oh wow. This sounds good. I have to add the book to my reading list. Review/Giveaway – By Cook or By Crook by Maya Corrigan Cozy Wednesday with Kathleen Ernst – Author of Tradition of Deceit – Giveaway too!